In this section you can find the range of different automotive sensors we stock, we decided to add this section and sell sensors separately after a few workshops that installed our multi gauge products noticed that the sensors that came with the kit were high quality without the high price tag, and they wanted access to them to use for people wanting quality sensors to connect to aftermarket ECU setups. Our pressure sensors are all high quality 3-wires sensors, 3-wire wire pressure sensors offer greater accuracy over two wire pressure sensors due to inherent design characteristics. Three wire sensors are also linear and more repeatable making them the choice for high accuracy measurement. Our map sensors are also 3-wire and share the same quality characteristics as the fluid pressure sensors. The fluid temp & EGT sensors are 2-wire with a separate ground on the sensor. Why this can be handy is a lot of cheaper temp sensors ground on where they are connected, it’s always a good idea to run grounds for sensors on an isolated ground circuit, so they don’t pick up nasty stuff that could be also grounding on the block or chassis and cause irregular readings. These can be good to setup oil temp, transmission temp, EGT etc into the ECU for logging or engine protection. If you are looking for a supply of quality pressure or temp sensors for use in aftermarket ECU installations, these sensors are great options for quality and accuracy, but without a high price tag. For shops looking to order in bulk, please feel free to email us if the quantity you are looking for exceeds the bulk quantity discounts listed on the site. Here we have a quality EGT probe also known as an exhaust gas temp sensor, it is rated from 0c - 130.. 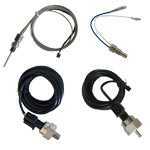 These 3-wire Oil & Fuel pressure sensors would be the most popular sensor that we sell by themselves.. Here we have a quality oil water fluid temp sensor rated from 0 - 150c using a 1/8 NPT thread, they ..